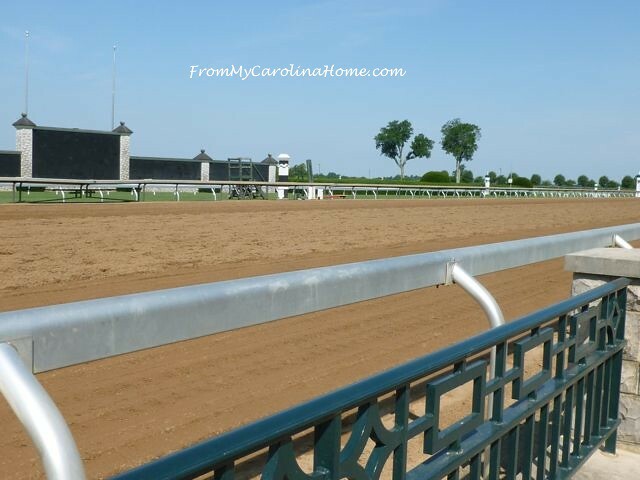 On our recent trip to Lexington, I was able to visit the Keeneland Racetrack and grounds. What a neat place to visit! There is such history here, for the history buff as well as the fan of horses. 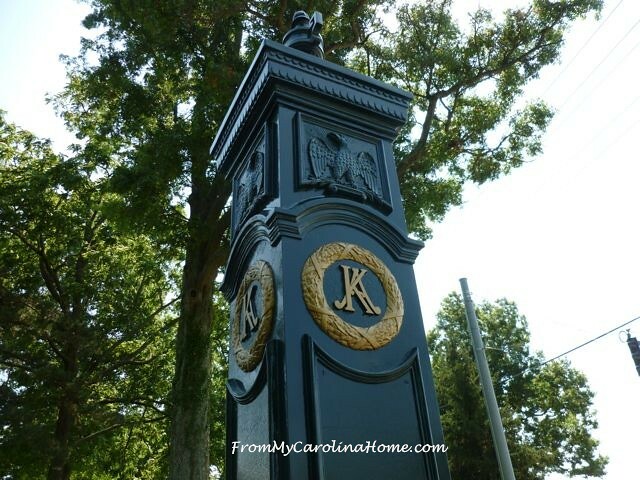 This history begins at the very entrance to the park, where the post is a replica of the original Kentucky Association track which was located in downtown Lexington. The monogram KA on the post is identical to the old Kentucky Association logo. While removing building materials from the old site, Hal Price, the first president of the Keeneland Association realized the KA would work for his track too, and help preserve that history. There were no races the week we were there, but the track and walking tour of the facility is open most of the time. If you get there early enough, you can watch the morning workouts on the track. I didn’t get there in time to see the horses training, but I could tell they had been there from the prints in the dirt. I did a self-guided tour using the printed map of the grounds that also gave a brief history lessons along the way. From the clubhouse to the giftshop, there was something to learn and appreciate. 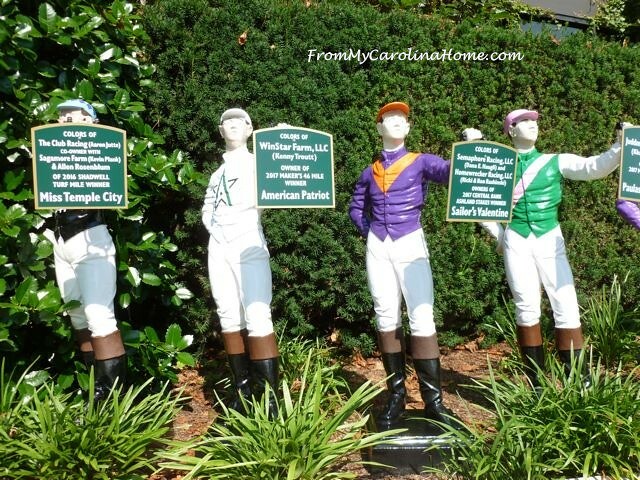 In the paddock area are a row of jockey figures painted in the colors of the winners of recent races. I can just imagine being here during the races. Of course, even though it isn’t the Kentucky Derby, I’d still need a pretty hat. 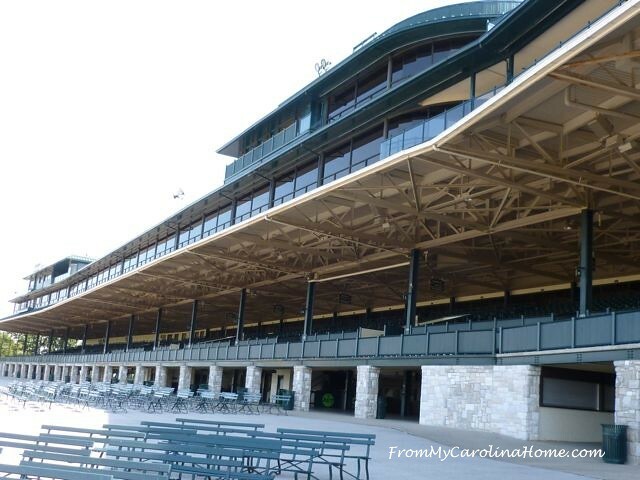 As magnificent as the track and associated buildings are, I want to show you the hidden gem on the Keeneland grounds. I would venture that since it is the last stop on the self guided tour, many choose to skip it. 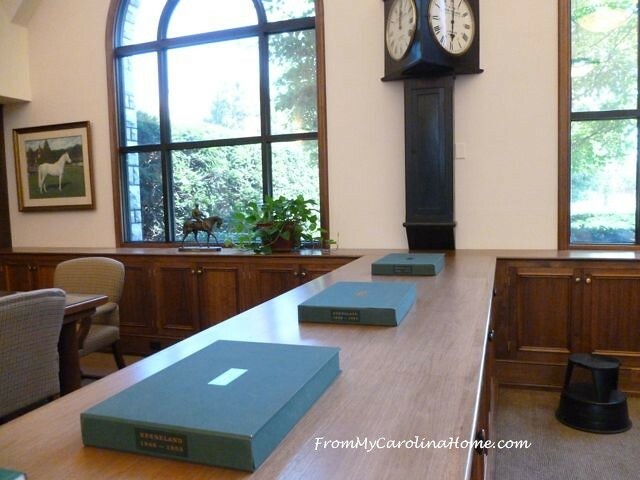 But, if you are close this year, the Keeneland Library is well worth the visit. 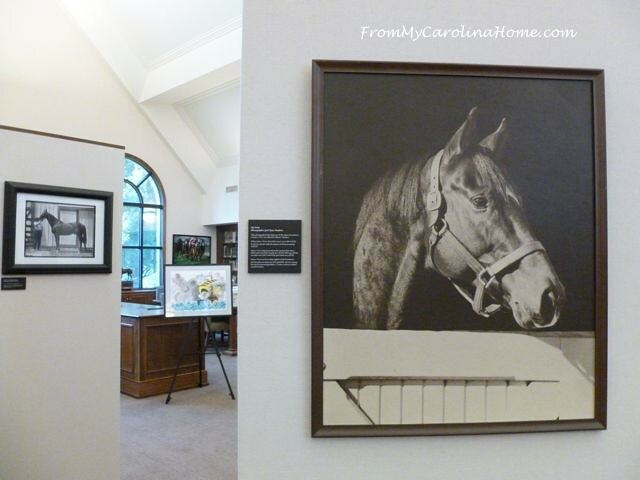 Established in 1939, it has collections of over 30,000 books, one million photographic negatives, and thousands of magazine and newspaper articles dating back to 1836 along with horse related art and sculpture, trophies and artifacts. It also has a collection of racing forms going back to 1896! This year marks the 100th anniversary of Man O’ War’s birth, widely acknowledged as the greatest horse ever to race. Not only did he win 20 out of 21 races (only losing one to a bad start), he is credited with reviving the horse racing industry in the public’s eye after the misery of the first world war. This unassuming, small building set on the outer grounds a short drive away from the track holds wonders available to the public. 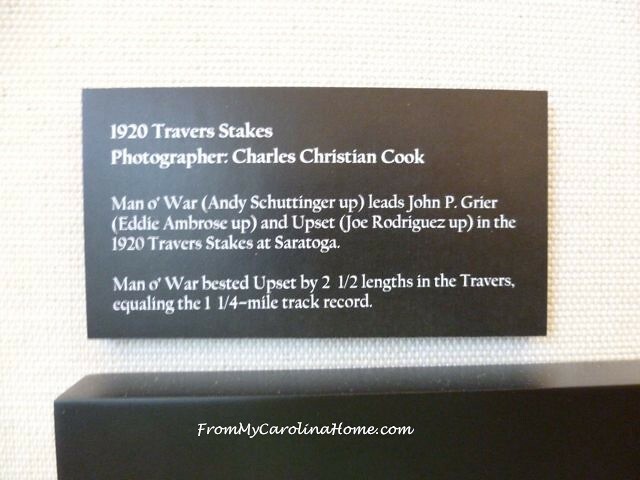 The exhibit this year runs to the end of the year, and is a photographic history of Man O’ War’s life and achievements. It begins with a short video shown on a small TV in a space the size of a study carrel. The video was very well done, with a lot of actual footage from races, and training exercises, interviews read from actual newspaper accounts and interviews, and the story of his funeral and enshrinement at Kentucky Horse Park, after being moved from the original burial site on Faraway Farm. The tour around the library itself took the viewer past many photographs from the time, nicely annotated with notes. Interesting photos and notes on his descendants are also on display. 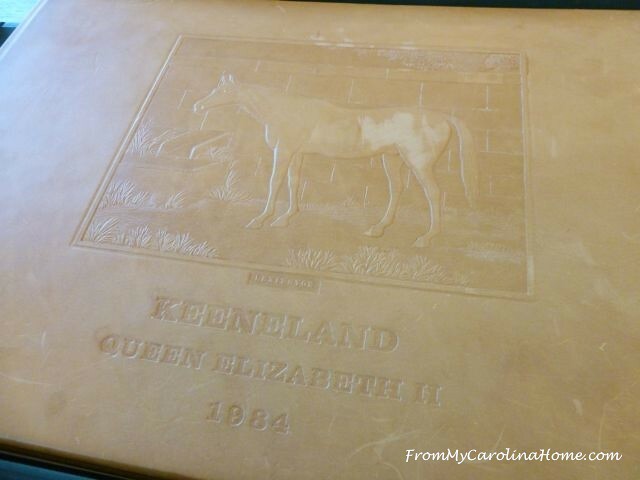 On the other side of the library from the photo exhibit are the photo albums covering decades of Keeneland history. Amazingly, they are available for viewing by anyone walking in the door, no white gloves needed. 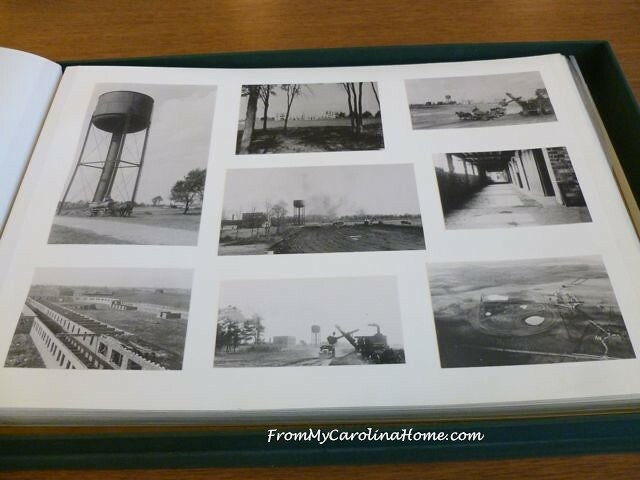 Beginning with the bare ground, you can see the photos showing the building of the track, going through all the improvements over the years, along with racing photos from major races in each year. Each book has several years worth of history. One book, though, was dedicated to one race. 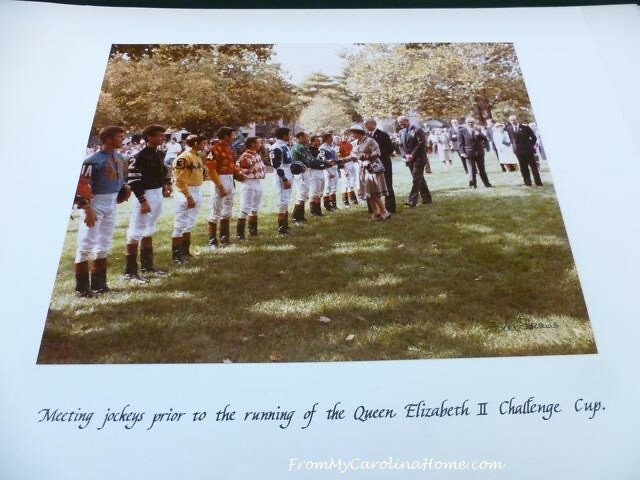 In 1984 Queen Elizabeth visited the track for a special horse race, The Queen’s Cup. 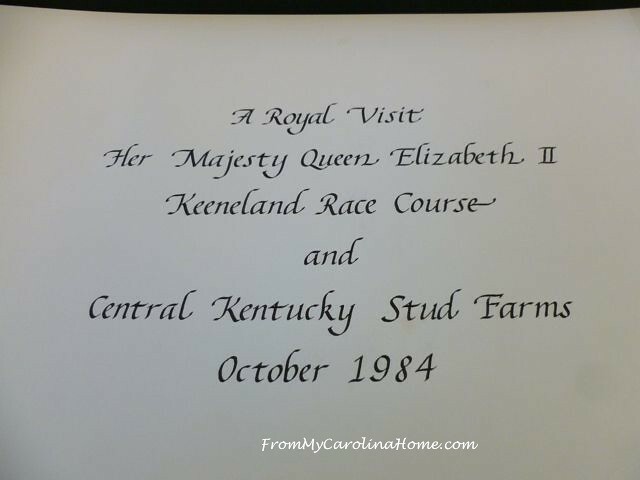 Inside were dozens of photographs telling the story of her visit and special race day. On a wall in a study carrel is a most fascinating history lesson. 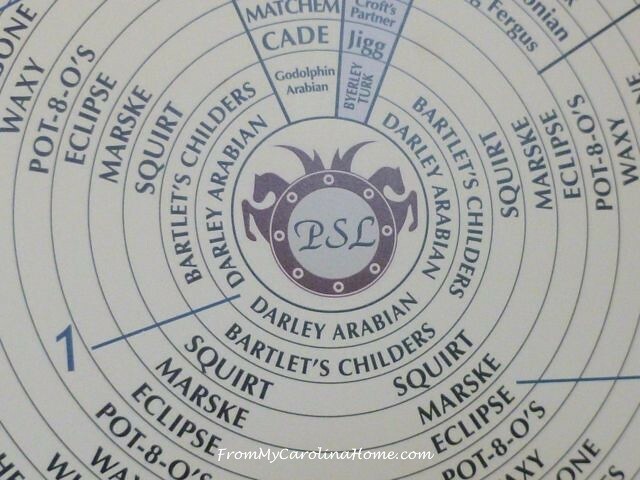 This is a geneaology chart from the first Arabian horses that launched a dynasty. It is circular in design as it is easier to see how the subsequent generations spread out with famous horses in the mix. 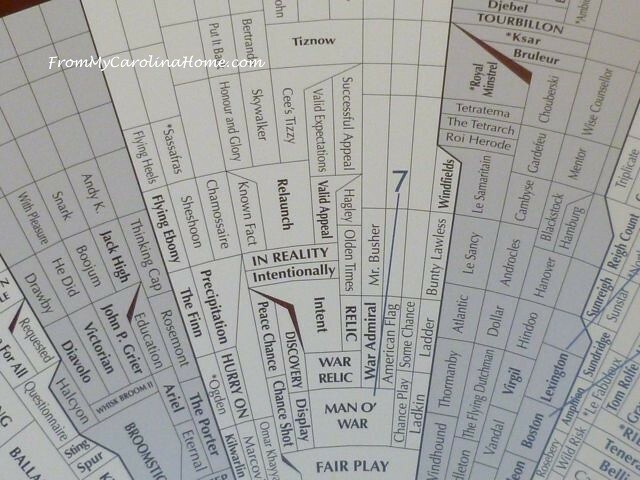 Here is where Man O’ War adds to the chart, siring War Admiral (the fourth Triple Crown winner) and War Relic, grandfather to Intent and Relic, and more. 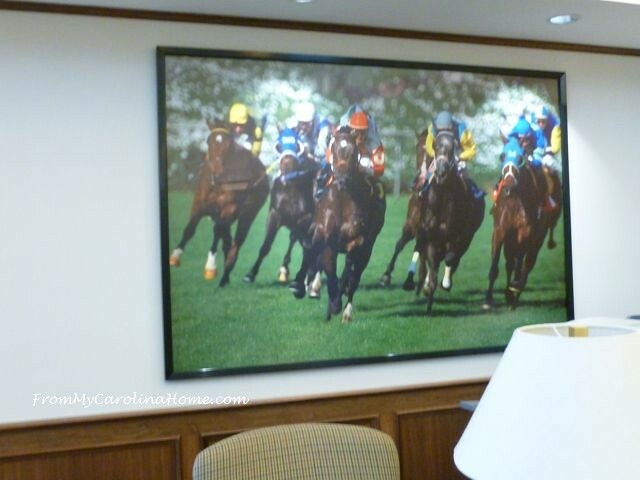 Permanent photographs are around the walls showing the excitement of racing in stunning detail. Gorgeous windows make a light and airy place for study. You’ll note there are not a lot of books on display, most of the collection is held underground in climate controlled areas, available to researchers. It is a non-circulating library, meaning they don’t check out materials, but make their collection available to researchers both in person and online. See the online catalog HERE. There are a number of statues and figures to see like the one on the windowsill here. If you are nearby this year, go see this beautifully curated exhibit. Thanks to librarian Dan Prater, who showed me all the interesting tidbits, and kept assuring me that pictures were OK, and yes I could touch the albums. 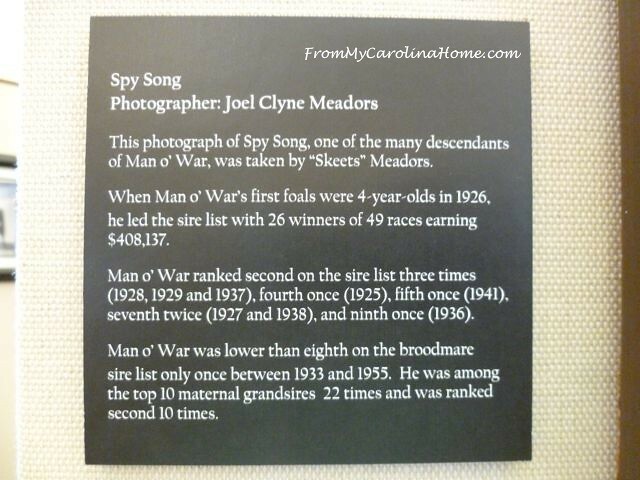 The Keeneland Library also has an online exhibit that you can see called Man O’ War: In Other’s Words. It is really something! Click on the link, the galleries are on the sidebar, and when you go to one, the photos are accessed by clicking on the titles at the bottom, one at a time, moving through his history. Do you enjoy horse racing? 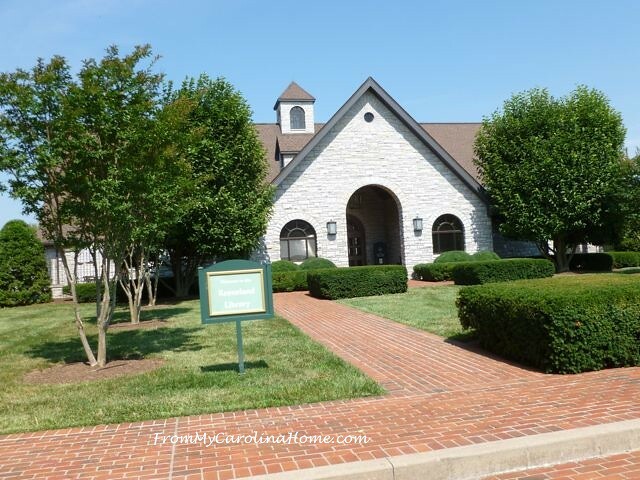 Have you ever been to Keeneland? Another fascinating tour and wonderful photos. Years ago when living in San Diego we enjoyed the races at Del Mar, very exciting. Thank you for the tour! My husband supports the veterinary side of the equine industry with high end technology, so we’ve been to Lexington/Keeneland many times. While he attended his meetings, I would hang out in the library. I agree with you that it’s a hidden gem! 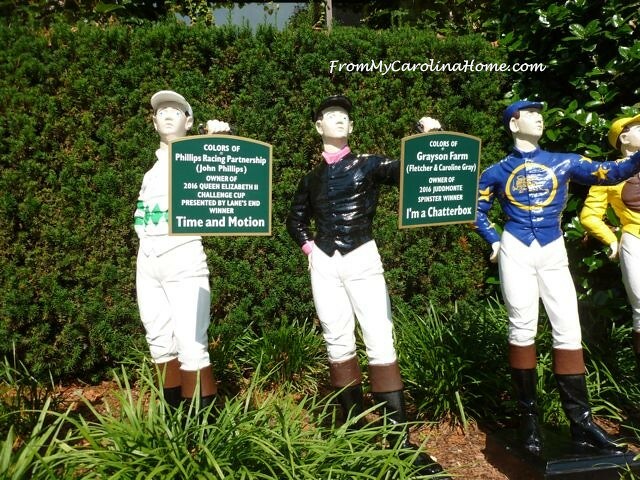 Beautiful horse park, proudly maintained, a true historian of racing. Of course, my other favorite spot on the grounds is the shop – I could spend many hours in there, not to mention the $$ ☺. Thanks for the great tour – I’m ready to go back! Wow….you never fail to send the most interesting posts from your travels! I am forwarding this to a buddy in Missouri who has horses and I know will enjoy this. 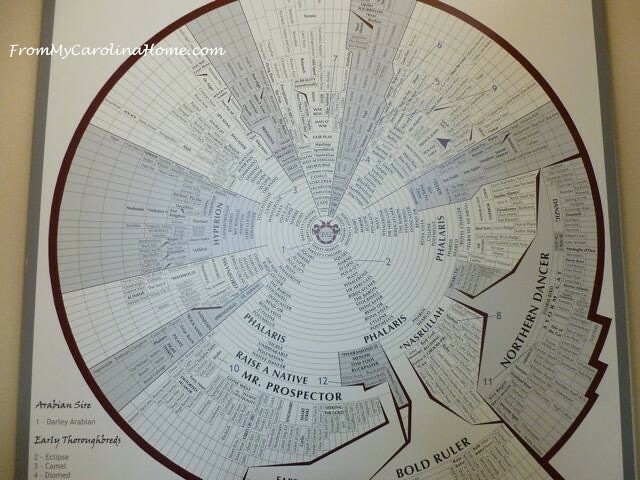 Love the circular genealogy chart. My half-sister was married to a jockey’s agent and the track always fascinated me. When I was younger, I got to visit breeder farms and watch closed circuit TV to the “labor stalls” while having dinner with the family who owned the farm. Just a little plug for that section on Man O War…..He was, indeed, the most amazing horse and the details about his personality and dignity are great! Hello Carole! Your post today was so interesting and full of information, it kept me wanting to know more and I do not know one iota about horse racing. I am so thrilled that you got to go and took the time to visit the library, how fascinating. Can you imagine what is available for people to research? Now that you have awakened my curiosity, I know my Father has relatives in oh wait never mind that is another state….LOL. If you do not mind, I will be sharing this on facebook? I think a lot of my relatives would find this very fascinating and quite a few of them take great family vacations and might want to consider this if they knew they could find history to share with their kids also! Thanks for sharing and have a great day! Very interesting. Thank you for sharing, Carole! 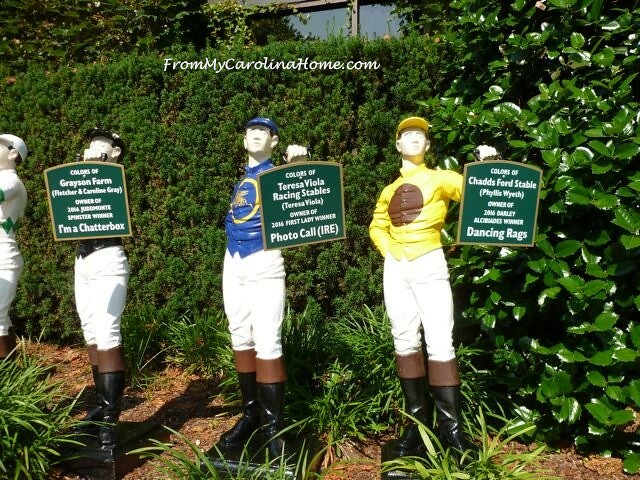 I had to share this post with my husband who is an avid horse racing fan. He has visited many racetracks, but not Keeneland. It looks like a great place to visit. Thanks for posting all of the interesting tidbits. What a great find. Thank you. Thank you for sharing with us, what a wonderful library, shame it is tucked away so most people miss it. My husband had a couple of race horses once upon a time in Arizona. He loves to watch them run. What a fun place to visit, thank you . 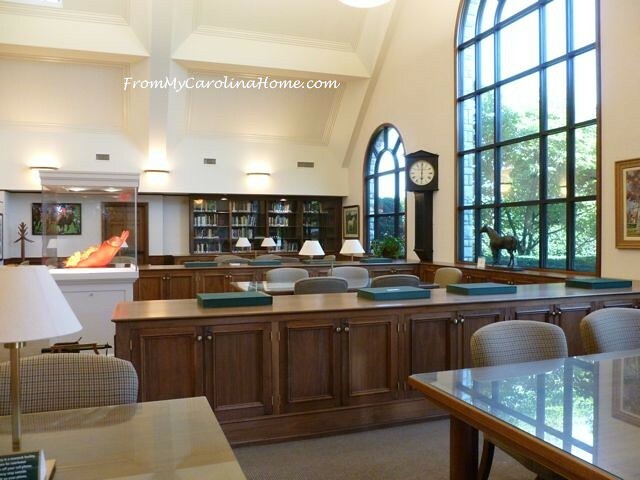 What a lovely library, with some fascinating history most of us don’t know much about to boot! 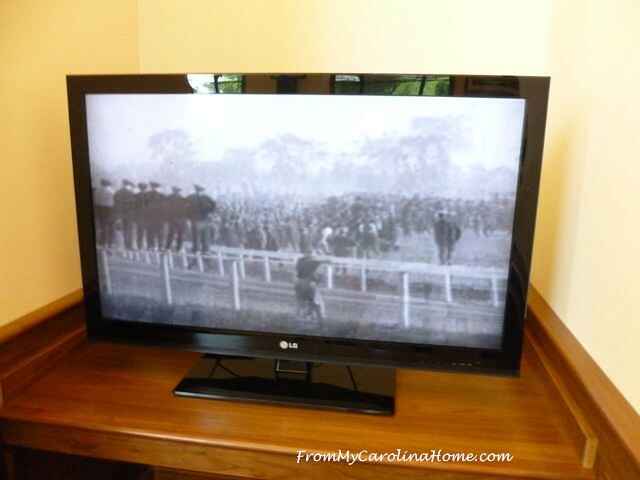 Never been to a horse race, but we have watched a few on tv over the years…fair weather fans I guess! That library looks like an amazing place to spend time. I’d like to take my Kindle in there and just read! The pictures and information on Man O’ War are fascinating to me, because my aunt talked about him a lot when I was little. 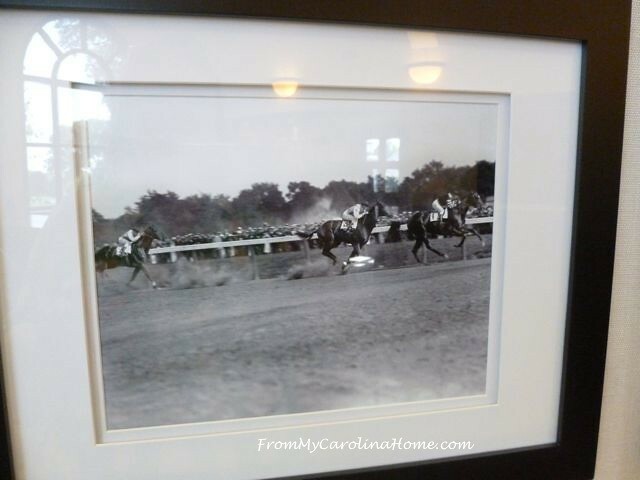 We also lived in Kentucky for a few years, and horse racing was popular there in the fifties everywhere! Great tour and a beautiful library! You always share such interesting places. Thanks for linking up to Take Me Away again! Enjoy your weekend!